I set out once again—like last week—to make this a Nonfiction Monday post, but this book also does not officially get lumped into the nonfiction category, though it’s based on an experience the author/illustrator had as a child. Ah well. I’m going to tell you about it anyway, because it’s a beautiful thing. …and on and on. There are many more such laudatory comments. The next day, however, the boy takes in the great wall map his father had purchased while he hangs it. “Our cheerless room was flooded with color.” The boy stares at it, is fascinated by it, and draws on scraps of paper what the map inspires in his imagination. He repeats the names of cities on the map, wonderful, delicious words that he turns into rhymes, “like a magic incantation,” and he is “transported far away” in his mind away from his hunger and sadness — “without ever leaving our room.” The final six spreads, resplendent in their color and magic, are of the places to which the boy flies in his mind (he is depicted as if in the air, flying to each destination): deserts, beaches, mountains of ice and snow, temples, fruit groves, busy cities. far from our hunger and misery. This is a picture book experience you won’t want to miss. The changes in scope and perspective and color from the early to final spreads in the book—reflecting the opening up of the boy’s world in his imagination—are stunning, Shulevitz’s art work full of engaging details and textures and angles and shadows; this is one you’ll want to pore over for a long time. 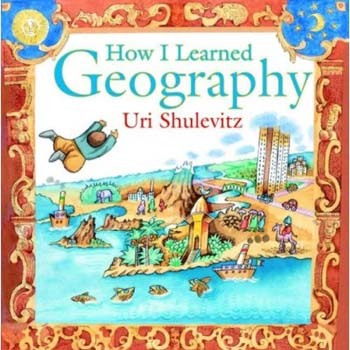 In an Author’s Note, Shulevitz notes that he lost the original map years ago but created them for this title based on his memory, using collage, pen and ink, and watercolor. He also explains that the story is based on his experience of fleeing Warsaw with his family in 1935 after the Warsaw blitz. He was four years old: “I remember streets caving in, buildings burning or crumbling to dust, and a bomb falling into the stairwell of our apartment building.” His family fled to the Soviet Union, living in what is now Kazakhstan for six years. He also shares his only surviving photo of himself from that period, as well as a map he drew on the back of a letter at age ten and a drawing he made at the age of thirteen. At turns playful and intense, and always emotionally stirring, I don’t think Ms. Devereaux of The New York Times is speaking hyperbolically when she calls it a masterpiece. And this is Shulevitz-as-an-artist at his best. This is one for all ages. For all art-lovers everywhere. Not to be missed. So, J – is this one gonna be Caldecott #2 for Shulevitz, or what? as i was driving along on the interstate today, my mind wandered to next year’s caldecott winner (based only on the year thus far, of course. i should state for the record: I AM NOT PSYCHIC. some readers may wonder, you know). why did my mind wander there? i dunno. anyway, i could see A Visitor for Bear or this book or What to Do About Alice? or In a Blue Room winning…i probably shouldn’t say this in case i’m forgetting some stellar book, but there. i said it. ….for the record. i’ll come back here next january and either cheer or say a big, loud, resounding D’OH! Wait! There’s also On the Farm. Yeah, I’m having a conversation with myself. Okay, okay. I’ve heard enough great stuff about this book, now I’ll got get me a copy! Our library copy of this book came in the week before last, and I got all misty standing there reading it there in Tech Services. I used this book as an example for a project in my library class. It is a wonderful book!